The 6-foot-5, 205-pound wide receiver committed to Midshipmen on December 15th, 2014, during an in-home visit by head coach Ken Niumatalolo and area recruiter Ashley Ingram. 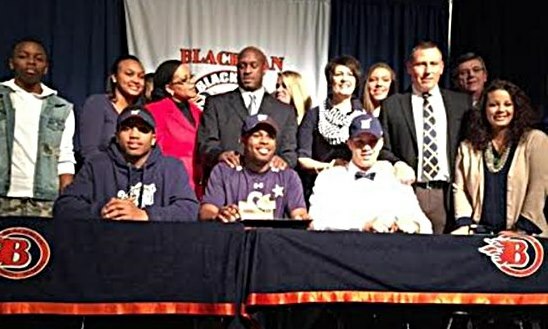 “I’m excited to make history as the first ever player-student from Blackman High School to commit to the Naval Academy. I’m also excited that, hopefully, two of my best friends and teammates, Ronnie Killings and Charlie Davidson, will follow in committing to Navy on National Signing Day. We have played four years of high school football together and I hope that we can continue our playing career for the Midshipmen as the ‘Blackman Trio’. “After my official visit to Annapolis, I felt at home and that I fit in with the other players and, most importantly, the coaching staff. Parrish Gaines was my player-host during my visit and he gave a lot of insight to life at the Naval Academy. I really like the town, ‘the yard’, the football facilities, and the location. Annapolis is close to Baltimore, which is only a 90 minute flight to Nashville. “Coach Niumatalolo, Coach Ingram and Coach (Mick) Yokitis were very consistent with their interest in me and staying in contact. Never once did they pressure me for a commitment. They were always honest and up front with me about my future. They saw me as a big threat, and that’s what they are looking for at the wide receiver position. With my size, speed, and great hands, they said that I will be a great fit for their program. In his senior year at Blackman, Quen Hardy made 46 catches for 600 yards and eight touchdowns. He was named Second Team All-Area, first team All-District. Quentin is the son of Quentin Hardy, Sr. and Denise and Christian Nordin. He is the brothers of two sisters, Ferrin Hardy and Hanna Nordin.